The league is now starting its seventh year. There are two new teams this year. Lakes will have two 3.0 teams - Lakes-1 and Lakes-A and so will New Albany - New Albany-1 and New Albany-A. The 4.0 teams remain the same. Because of the difficulty in fielding courts on a regular basis, the 3.0 teams will have just two courts per contest. There will be detailed player information kept for both leagues and the winner of the 3.0 League will be determined by the number of courts won rather than by the number of matches. If you are unsure in which group you belong, take a look at the new APTA's Player Self-Rating Assessment Tool. The 4.0 players will normally be 3.5 to 4.5 range. The 3.0 players are in the 2.5 to 3.5 range. Rate yourself, but also rate a friend who is better than you and a player who is worse than you to gain a better understanding of what you need to do to improve. 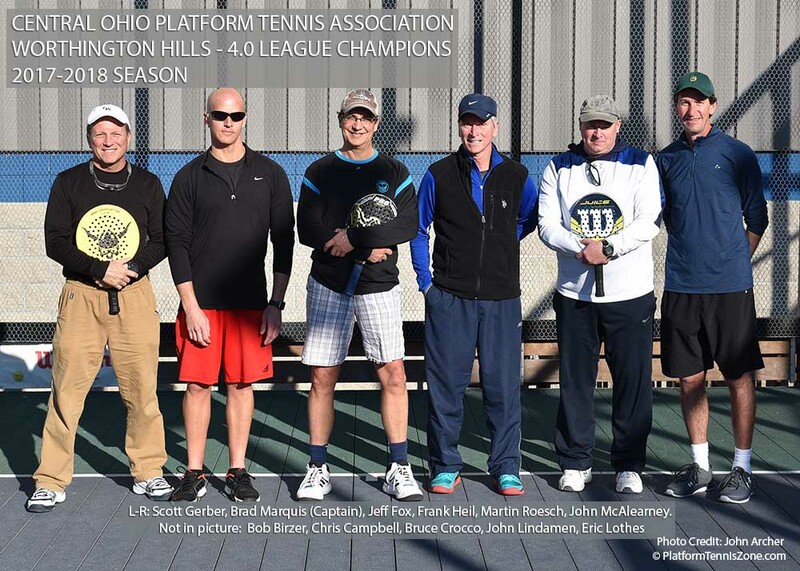 The 4.0 captains are: Jared Hurst (Elysium), Mike Lindell (Lakes), John Archer (New Albany), Bill Cseplo (Scioto Country Club), Rob Martin (Swim & Racquet), and John Lindaman (Worthington Hills). Click on the links to see the results for each team. The 3.0 captains are: Steve Wylie (Lakes-A), Steve Taneff (Lakes-1), Shaun LaJeunesse (New Albany-A), Don Zimmerman (New Albany-1), Don Ross (Scioto Country Club), John Blue (Swim & Racquet), and John Sheridan (Worthington Hills). Click to obtain the contact information for the League Captains. Click to view the 2018-2019 schedule for all teams. During the 2017-2018 season, Worthington Hills won the 4.0 league and Lakes won the 3.0 League. The cost to participate this year will be $150 for each 4.0 team and $100 for each 3.0 team. Each club will pay the same fixed amount, but captains will determine the amount for each team. The cost will be dependent on roster size, club fees, balls, food, etc. Some of the major tournaments scheduled for this season include: Midwestern's (Cincinnati) - January 12-13; Columbus Open - February 2; Peachtree Open (Atlanta) Feb 23-24; Indianapolis Open - February 22-24; The Nationals - March 7-10; and APTA National League Championships April 6-7. More pictures will be added as the season progresses. Please note that the pictures can be enlarged by clicking on them. Names are included to promote the camaraderie of platform tennis. If you would prefer that your name not be listed, just let Scott Gerber know.